A fantastic Hammock Underblanket which is compact, lightweight, easy to set-up and suitable for use in temperatures down to -5C. 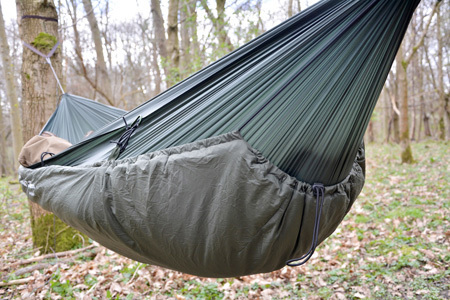 They are regarded by many hammockers as the best form of hammock insulation in colder weather. The Underblanket hangs below your hammock and when fitted well (easy to do) creates a small pocket of air between it and your hammock. This air pocket will heat up and keep you warm. In hammocks the majority of heat loss is from below due to the compression of your clothing/ loft in your sleeping bag by your body weight - the Underblanket combats this by hanging below your hammock so the loft is not compressed. It should be hung close to your hammock so it gently hugs the hammock when you're inside. DD Underblanket is 2m long - so when set-up it will provide almost full length insulation for most people. We recommend setting it up with a little bias towards your head end of the hammock so if anything only your feet will be just outside it. As shown in the diagram it comes with 8 lengths of elastic all with DD Mini Karabiners attached for easy set-up. It is possible to set-up using just the 4 end karabiners. However all DD Frontline, Travel, Jungle and Superlight Hammocks (made since 2012) have side attachment loops to attach the side karabiners to for a closer fit. *To get the best hang you will need to adjust/ shorten the length of the elastic cords slightly depending on your hammock.